The date was 1497 and the emperor, Ahuitzotl, stood in the Sacred Precinct of the great temple Templo Mayor, built in the center of the Mayan capital, Tenochtitlan. He had just completed the sixth set of major renovations to the temple; it now had four sloped terraces, giving it a silhouette similar to the pyramids in Egypt. On top of the terraces, instead of a sharp point, there was a huge platform measuring approximately 100 by 80 feet. Built into the platform were two shrines, one dedicated to the god of water, Tlaloc, and the second to the god of war and of the sun, Huitzilopochtli. Each shrine stood a couple of hundred feet high and was guarded by braziers containing everlasting flames, and there were statues of guardians there to protect the shrine. There were two stairways, one for each shrine, which rose from an intimidating serpent head at the base of the temple and terminated in front of the shrines. The entire building was covered with stucco and beautifully painted. Facing the main temple was a circular temple dedicated to Quetzalcoatl, the serpent god who had feathers instead of scales. The Emperor was exceptionally proud of this shrine to important Aztec deities, and he gave the instruction for the dedication of the temple to begin. The priests began leading sacrificial victims up the steep stairways and at the top, each victim was laid over an altar and his chest flayed open so that the priest could rip his still beating heart out of his chest to raise it in offering to the gods. The body was then kicked down the stairs. Soon the stairs were awash in blood and the bodies of the victims. Still, the line of prisoners of war stretched along the Sacred Precinct and up the stairs; by the end of the dedication ceremony more than 4,000 people had lost their lives in ritual sacrifice. Ahuitzotl was happy and felt sure that the gods were pleased and that his world of neatly planned cities, running water, refined sanitation that included daily bathing, and magnificent temples would be safe for generations to come. Sadly, this was not to be the case. In 1519, under the rule of Ahuitzotl’s nephew, Moctezume II, the Spanish conquistadors led by Cortez arrived. The demise of the Aztec lands was charted in the stars. The Spanish had fought their way from the coast and along the way collected a vast army of the Aztec’s enemies, who chose to fight on the side of the Spanish. 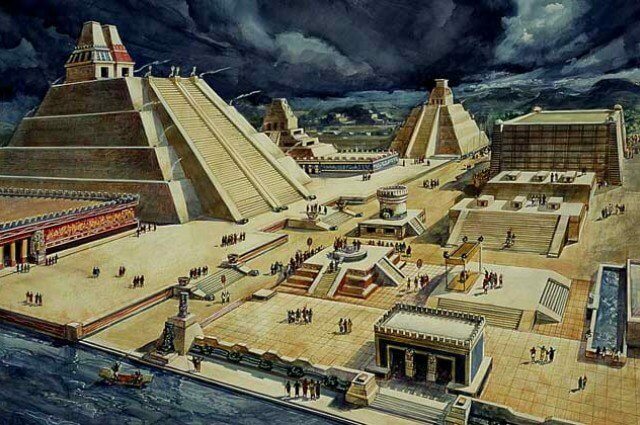 The Spanish were astounded by the size of the Aztec capital city, which was built on a marshy area. Buildings were erected on top of wooden piles driven into the soft ground; canals and water abounded. The view must have reminded the Spaniards of Venice as the size and magnificence of the city must surely have rivalled that of the great European city. Not only was the city a magnificent sight, but there in the very heart of Tenochtitlan lay the Sacred Precinct enclosing its seventy eight sacred buildings and dominated by the magnificent Templo Mayor. The Spanish were welcomed by Moctezuma, and the Aztecs paid handsomely to stop the Spanish from laying waste to the city. The Aztecs, in the summer of 1521, rose up against the Spanish and drove them out of the city. The Spanish were left once again viewing the city from the marshes, but this time they had left sixty-two of their compatriots behind and, as Bernal Díaz wrote in his journal, “The dismal drum of Huichilobos sounded again, accompanied by conches, horns, and trumpet-like instruments. It was a terrifying sound, and when we looked at the tall cue from which it came, we saw our comrades who had been captured in Cortéz’s defeat being dragged up the steps to be sacrificed.